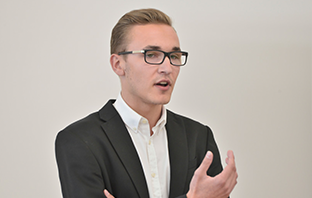 Gediminas Uzkuraitis (pictured) graduated from SSE Riga in 2014, and in 2016 he co-founded Be&Do Value Consulting, a consulting company with offices in Vilnius, Tehran and Dubai. He was led to do business in Iran, for many a pariah state, by his Swiss business partner, and got involved before the US started pulling out of the so-called Iran nuclear deal, by which Tehran agreed to restrict its nuclear technology development programmes. “I am not sure whether this step by the US is a crisis for our business. Sanctions are there already, the banking system is disconnected from world networks, the US can’t do business with them, their currency may take a hit, but we are on the European side, which has not pulled out of the agreement,” Gediminas says. Controversy – at least as a hobby – is nothing new for the Lithuanian SSE Riga graduate. “My fondest memory of SSE Riga is the Debate Society. It was the best part of my education, as it gave a liberal arts education on subjects unrelated to business studies. Debates were held on a range of issues,” he recalls. One of his favourite memories is making the finals in a debating competition at Cambridge University. Gediminas stresses that Be&Do does a wide range of work and one should not focus only on its presence in Iran, where it has a stake in a local agency. “We invent new products and services by monitoring global trend developments, then we figure out how to brand, sell and scale them,” he says. The work, he explains, involves a variety of products, services and business problem-solving. “We have around 50 projects and clients – one week we might deal with a construction project, then a cryptocurrency issue, then we might help a bank. Mostly our clients are from the financial sector and startups,” says Gediminas. Although Be&Do is almost two years old, co-founder Gediminas says the consultancy doesn’t have to pitch its services. “Clients come to us,” he says. One reason is that, at least in the Baltic region, a company run by SSE Riga graduates has credibility and trust. “It provides a valuable entry into the job market. Then when you're your own business or reach a higher company position, when it comes to local clients, SSE Riga alumni form a small community of trust,” he explains, adding that the SSE Riga “brand” outshines even prestigious international business schools on the Baltic regional market. “Coming from SSE Riga you have passed the bar of a good education and have the network, especially if you want to make a career in the Baltic area. Those who studied abroad have few or no connections, while the SSE Riga graduate does,” Gediminas says. Remembering the teaching process, he recalls that, often, the entire class of around 120 students sat in the same lectures, yet almost all courses encouraged work in smaller groups to complete assignments and solve problems. This helped students to get to know each other and to develop group work and collaboration skills.